simply beautiful « AFTER THE POP ! One of the 1970’s most popular vocalists, Albert Greene (he would later drop the “e” at the end of his name) was born on April 13, 1946, to a family of sharecroppers in Forrest City, Arkansas. Singing gospel was a part of his life from an early age as he toured the gospel circuits of the South with the Greene Brothers, a quartet he formed with his siblings. Later transitioning from gospel to pop, he formed Al Greene and the Creations when he was only 16. But it was in Midland, Texas, in 1969 where Green met his most important music collaborator, Willie Mitchell. The bandleader, producer and a vice president of Memphis’s Hi Records signed Green, leading to his first single, a cover of the Beatles’ “I Want to Hold Your Hand.” Mitchell became Green’s producer and songwriting partner for the next eight years. Green’s first gold single, “Tired of Being Alone,” reached No. 11 on the pop charts and No. 7 on the R&B charts in 1971. In the early days, Green loved the music he heard from the likes of the great singers of the day and tried to imitate their sound. During an all-night recording session of Green’s hit single “Let’s Stay Together,” Mitchell kept asking Green to stop imitating Jackie Wilson. Green left the studio in anger and told CBS Sunday Morning in 2005, “I rode around for 20 minutes, I came back and I said, ‘Forget this, man. I’m just going to sing this and I’m not going to put any feeling in it. I’m not going to put no emphasis in it. I’m just leaving it dry, just sing it. '” After a single line of music, Al Green had found his sound. But Green felt a different calling in the mid-70s; a religious experience while he was on tour led him to great personal change. He purchased a church building in 1976 and was ordained pastor of the Full Gospel Tabernacle Church, just down the street from Graceland. However, Green continued to pursue his pop career, preaching at his church only when he was not on tour. When he fell off the stage at a 1979 concert in Cincinnati without serious injuries, he considered the incident a warning from God and public appearances were limited to only religious services in churches across the country. Gospel label Myrrh released his 1980s religious recordings featuring standard hymns and Green’s originals—a style that mixes Memphis soul with gospel. He wouldn’t stay away from the Memphis soul sound of his roots for good, returning with the 1992 recording Don’t Look Back. Willie Mitchell and the soul singer reunited on 2003’s I Can’t Stop, working together for the first time in 18 years. At the age of 62, Green released Lay It Down in 2008, produced by Green, Poyser, and the Roots’ Ahmir “Questlove” Thompson. “No one has range like Al Green,” noted Thompson. “He’s like a five-part harmony chorus inside his own body. There’s the falsetto Al Green, church growling Al Green, ferocious soulful Al Green. There’s the very church mouse Al Green. And then there’s the comic side that no one really sees.” The album featured duets with artists such as John Legend, Corrine Bailey Rae and Anthony Hamilton. “It’s an honor to get to work with someone who I’ve always loved and respected, who’s been an important part of black music history, and pop music history for that matter,” said Legend of the experience. Green’s performing prowess continues to surprise. When two singer cancellations affected the 2009 Grammy Awards, the producer asked Justin Timberlake to perform. Timberlake declared, “Al Green. If Al Green will do ‘Let’s Stay Together’ with me, I can do it.” After a quick rehearsal, Grammy lore was made. Al Green embodies the Memphis Sound—funky soul music, shimmering and sultry in its style, a perfect blend of the spiritual and profane. 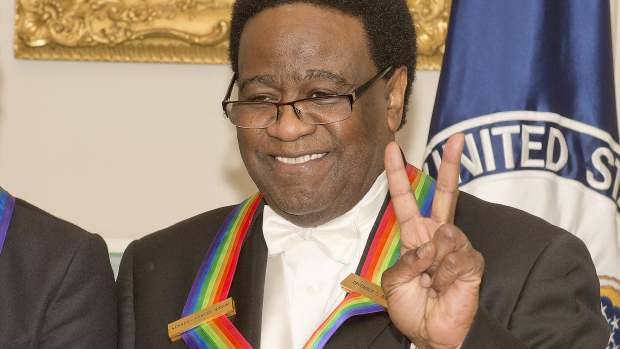 He would straddle the line of sacred and secular throughout his career, being inducted into both the Rock and Roll Hall of Fame and the Gospel Music Hall of Fame, dubbed “The Soul Doctor” as well as the Right Reverend Al Green. “The music is the message, the message is the music,” preached Green. “So that’s my little ministry that the Big Man upstairs gave to me—a little ministry called love and happiness.”…. reprinted from kennedy center website…. This entry was posted in 2nd stage recovery, Buddhism, emotional sobriety, life on life's terms, recovery and tagged al green, kennedy center honors, music, peer support. Terrific blog post. Very good at describing the way we hear his music. Thanks.